My sister and I have been blessed with sharing our first pregnancies together, due only two weeks apart from each other! Our family recently threw us a joint bird’s nest baby shower. All the details were too cute not to share! All guests received the following invitation, designed by yours truly. 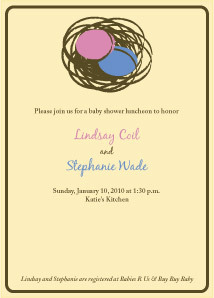 Most of the invitations made to order for two babies were for twins. So we created the bird’s nest theme. My sister is having a girl and I am having a boy, which was represented by pink and blue eggs. 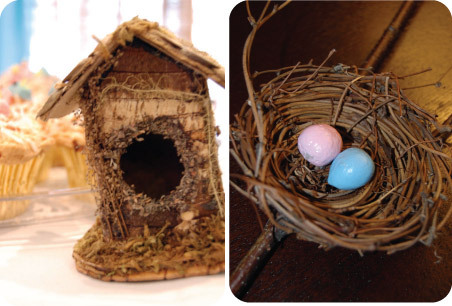 The nest theme was continued at the shower, with bird’s nest and bird house table decor placed throughout the room. 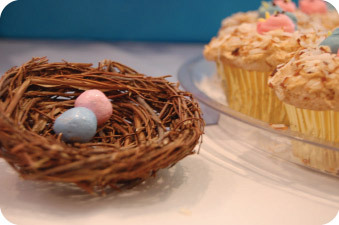 Bird’s nest cupcakes, inspired by a Martha Stewart recipe, were served for dessert. The vanilla cupcakes with my mom’s homemade buttercream frosting and toasted coconut were delicious and quite a hit! 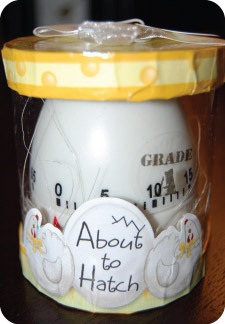 My sister and I were both given egg timers as we began opening gifts. We set the timers and gifts were given when the timer rang to those whose gifts we were opening at that time. Gifts included bird candles and matches from The Home Market. The party was a great success! Thank you to everyone who helped make the day so special! How. freaking. adorable is this???? Geez!!! 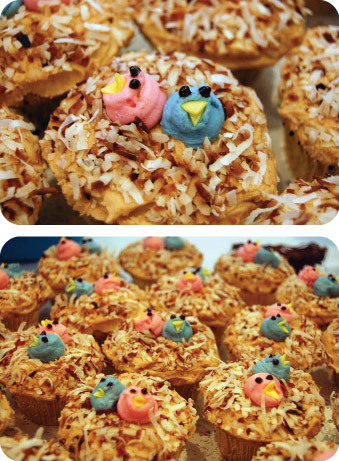 Heh, love those little birds on the cupcakes. What a cute theme! Congrats to you both. And happy nesting!! 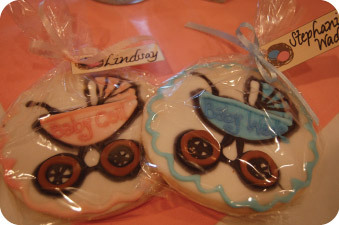 Aww, I love this baby shower theme! And you guys are so beautiful! !